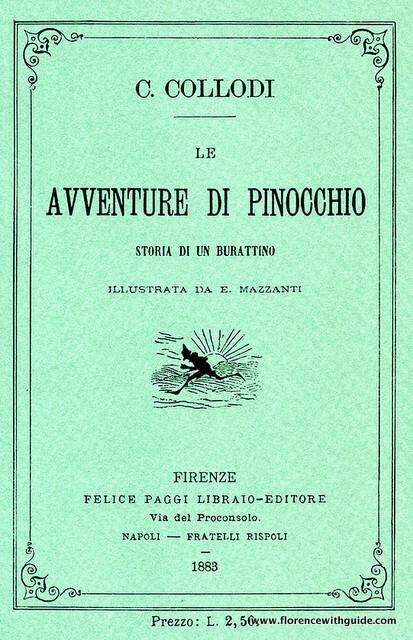 On July 7th 1883 Carlo Lorenzini, under the pen name of Carlo Collodi offered for publication The Adventures of Pinocchio, published by Paggi and illustrated by Enrico Mazzanti. It was an immediate success and even today after more than a hundred years the celebrity of this marionette is not fading. 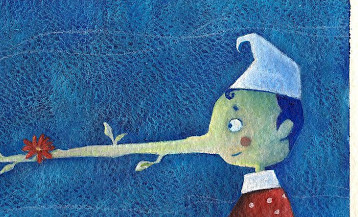 Pinocchio is one of the most translated Italian books: was published in 240 languages. Something that writer Carlo Lorenzini could not imagine, and did not enjoy. Pinocchio wasn’t born in 1883, but two years earlier when Carlo Lorenzini had started writing the adventures for the «Giornale per i Bambini» (the Children’s Journal), one of the first children’s magazines in Italy which founded its fortunes on the misadventures of the marionette. The first story of the marionette was published on July 7th 1881, when Carlo Lorenzini was 55. He was of modest origins, son of a cook and a maid, had been educated in a seminary but had soon abandoned the idea of becoming a priest. Lorenzini fought for Italian independence, and after the reunification he started writing on Florentine events using his sharp pen. He led a bohemian life working as censor for the theater, but more frequently gambling and losing. It was a severe loss that made him accept the offer of his friends Ferdinando Martini and Guido Biagi to write a story for their new children’s journal. The accompanying note said: “If you print this, pay me well enough to make me willing to continue”. The adventures of a marionette developed and evolved following the ups and downs of Lorenzini’s bets and gambling habits. If he lost he wrote pages and pages, if he won he became lazy and the young readers wrote impatiently asking for the next chapters….until 1883. It was the enormous success of the book’s publication that changed Pinocchio’s destiny. Collodi intended that the marionette die, hanged at the big oak, as punishment for his mischievous tricks. It was the readers that would not surrender that pushed Collodi to invent his last minute salvation performed by the Fairy with Turquoise Hair. At the end of the story Pinocchio becomes a good and obedient boy, but whether Carlo Lorenzini followed in the footsteps of his marionette and stop gambling…we shall leave to your conjectures. P.S The plaque commemorating the house where Collodi died less than ten years after completing Pinocchio is in Via dei Rondinelli 17 (now fancy Richard Ginori porcelain store, a few steps from the Duomo). « Visiting gardens in Florence and around. Home / Blog / Happy Birthday Pinocchio!